Using the Query Data tool in Dashboards, Linn Systems' Charlie explains 5 helpful tips to use this reporting function for any e-commerce business. 1. Using Linnworks to host your images. Wouldn't it be great if you could use the images on Linnworks and upload them on to your site, or a marketplace, that is not yet supported by the listing tool? One of the great features of Query Data is that you can export the Image URL (web addresses) into a CSV file. You can then copy and paste the data, or use vLookup in Excel to assign the image to the product for your own channel’s CSV file to upload. 2. Find your best sellers and action your end of line products. Using the Query Data tool again, you can find out which items sold the most, on which specific channels, in which country and can filter this by date. This is a really powerful function, as it lets you analyse and execute actions based on price, demographics and the selling channel - thus allowing you to improve your sales. 3. Market directly to your customers. Imagine if you could pick out orders from your systems that may be potential B2B clients, or you want to send existing customers to your own website. Well you can export all customer information from previous sales into a CSV file, from here you can create marketing campaigns for advertising your own site, find potential B2B clients, and even generate a call list if you have a telesales team. The query you need is called Customers. Please note, some channels have terms and conditions about contacting customers directly. 4. End of day reports. Using Query Data again, we can process this report not to just show how many orders or money you have taken, but also on what channel the sales have been taken on. 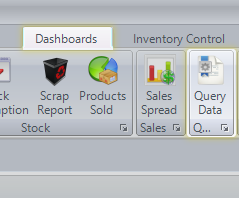 Alongside the Sales Dashboards, Query Data also allows you to run an Order Export. This allows you to see how many orders you have taken for a day and the total income that these orders have generated. You can filter this by Channel also. The query you need is Total Orders by Day, Source and Subsource. 5. Stock sheets into order forms & price lists. Have you got a supplier that won’t except your fantastic looking Purchase Orders and wants you to use their spreadsheets for generating orders? Or do you require a copy of all your stock items in a Spreadsheet? You may want to use to create a price list for a trade show or B2B. Well we have a great export called Stock Items that will export all your stock items including SKU, Prices, Titles, Quantity and many more details. You can copy and paste these details in to your suppliers spreadsheet or use the vLookup function in Excel. So where do I find Query Data? We have some in-depth information on our support page about the Dashboards in general which can be found here. Below we have a guide of how to access Query Data via the Linnworks. To access query data, you go to the Dashboards tab in Linnworks, then select Query Data and select the report that you will run to run. Once you have selected the Query type and selected the Date Range, click execute to generate the Report. To export it simply click the button with the Excel Logo and that will create a CSV file with this data.